A week or two ago I posted this picture of a Bob Evans sausage gravy dispenser, thinking that it was a one of a kind thing; a dream that could never become reality. Little did I know, you can buy the damn things directly from the company. Reading the website brought tears to my eyes. “Bob Evans has been making classic sausage gravy for more than 30 years. It is ready to eat and not a concentrate, so you’ll have consistent quality and flavor batch after batch. 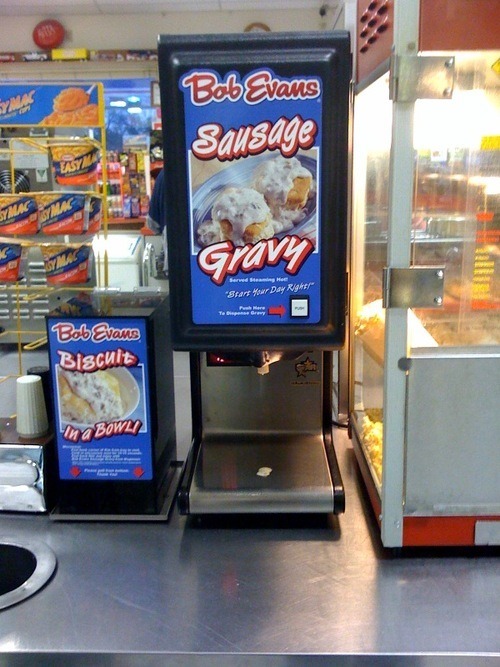 New in 2008 is our Sausage Gravy Dispenser that dispenses hot Bob Evans sausage gravy at the touch of a button. This machine uses our convenient dispenser pack Sausage Gravy, #4385. If anyone feels like donating one of these to the Make John Moors’ Dream Come True Foundation, let me know. It would be a great opportunity for a tax write off. ..And by the way, what makes Bob Evans think I would use this for customers? I wouldn’t use this for any damn customers. This would be for me, and only me. Thanks to Stephanie for discovering this dream was actually possible. This website is cracking me up.